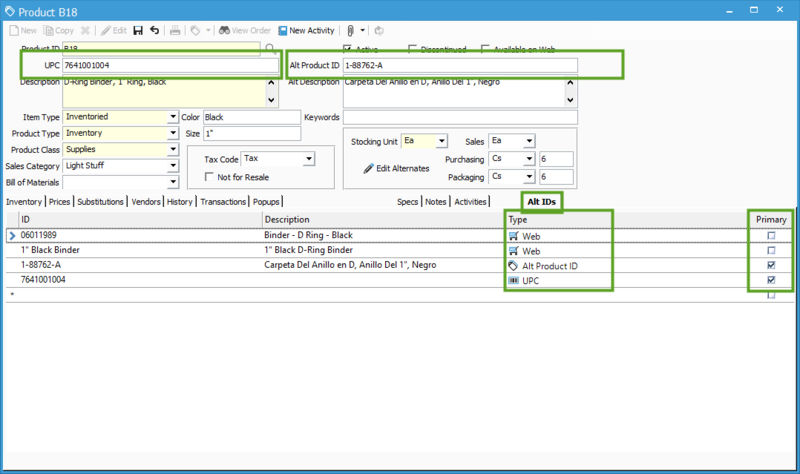 Starting in Acctivate version 10.3, users can add multiple alternate Product IDs for a given product, and each alternate ID can be specifically linked to a web store template so that the web store ID is used on imported orders. This article will show how you can configure these alternate identifiers and relate them to different web store templates. In the screenshot below, notice the Alt IDs tab in the Product window. This will show alternate Product IDs as well as UPC codes for the product. 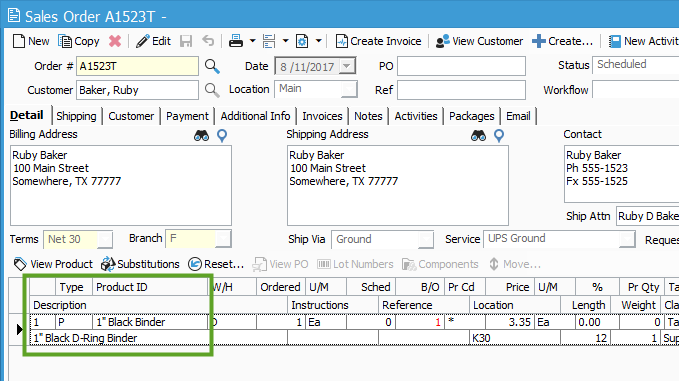 The UPC and Alt Product ID fields still show in the header, these show whatever is marked as the Primary UPC and Alt Product ID, defined in the Type column. For B18, the Primary UPC code is set to 7641001004, so it shows in the UPC field in the header. The Primary Alt Product ID is 1-88762-A, so it shows in the Alt Product ID field in the header. While on the Alt IDs tab, click Edit to enter edit mode, then you will see a new blank line appear under the other alternate IDs. Here, you can set a unique alternate ID as well as a Description. The Type column will allow you to set this as a general Alt Product ID, UPC, or you can set an Alternate ProductID to relate to a specific web store template. Highlight the Web Store field and you will be able to see all active web store templates. It is possible to have a different Alt Product ID for each web store template. In the screenshot below, notice that the alt ID 06011989 is related to the Shopify template, while 1″ Black Binder is related to the Magento template. When orders are created from a Web Store sync, the order will show the Alt Product ID related to that web store template. Order A1523T was created from a sync with the Magento template, so “1” Black Binder” shows as the ProductID and “1” Black D-Ring Binder” shows as the Description on this order. Acctivate will allow multiple products to have the same Alternate Product ID, for more information on how that works, see this help article.